I’m officially in the third trimester! And I owe you all a proper pregnancy update. I also owe you a writeup of our trip to New York City! Look for those in the next week or so. The latest quick news is that I failed my initial glucose test >.< The glucose test is a standard early detection test for gestational diabetes in which you drink a sort of extra-sugary Gatorade and have your blood taken after an hour to check your blood sugar. If it’s below a certain level, you’re clear; if it’s above, you go back for a longer test with more sugar and more blood sticks. I have the longer test next week. If I fail that one, it means I have gestational diabetes, which would mean that I would have to temporarily change my diet, exercise more, possibly have to take insulin shots. Let’s just say I’m not excited about this. At. All. I started looking up a gestational diabetes diet, and it includes having lean protein at every meal, and cutting down on carbs and sweets. Including fruit (nooooo). I realize that there are millions of people–likely some of you–who live with diabetes and live quite well. I also know that there are plenty of other women with much worse heartache than the possibility of a temporary condition, so I’m working on keeping perspective. I am, however, cutting down carbs a little regardless of the test results (not fruit, though. I’m clinging with both hands until I’m told I absolutely have to cut back). I’ll report back in a couple of weeks. Wish me luck! I’ve been tweaking this recipe for months until it’s just right. I experimented with using zoodles vs. noodles, chicken vs. tofu, and my favorite combo is noodles with tofu. But it’s flexible–if you like something else, you can easily change it. But as written, this recipe is vegetarian! I like soba noodles because they’re partially made of buckwheat, which is a grain that’s high in protein. 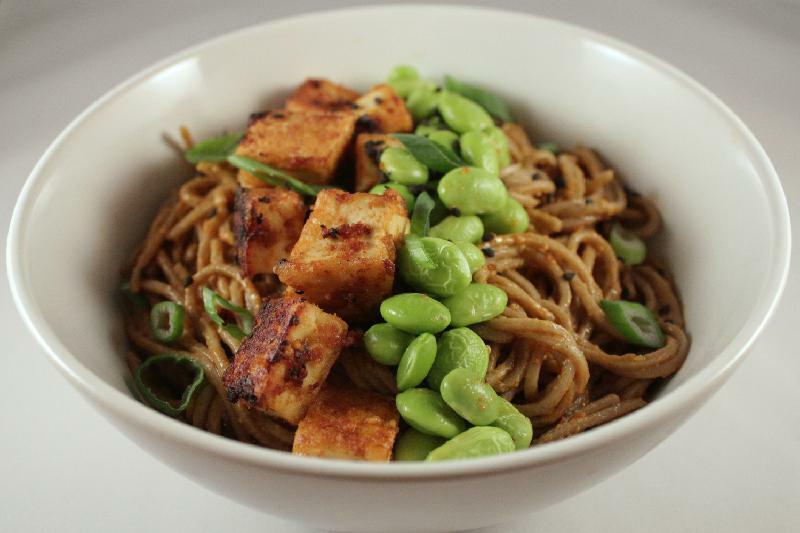 Between the noodles, tofu, and edamame, one serving of this has 30 grams of protein! As Robby said, this dish is brought to you by SOY. It’s also covered in a delicious sauce that has just enough slow heat to keep your attention. If you like this one, check out THE most popular post on Bear & Bug, Hibachi Noodle Bowls! Start water boiling for the soba noodles. Cook according to package directions. As soon as they’re done, drain and rinse with cold water to stop them cooking. 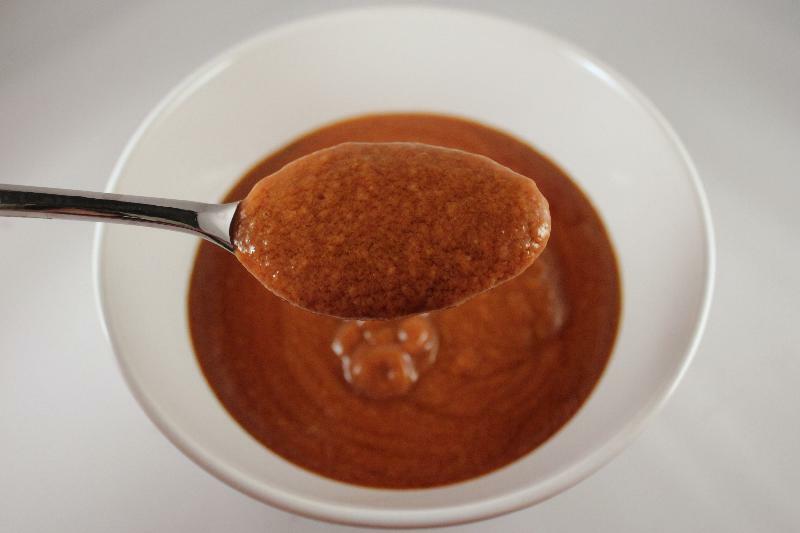 Place all sauce ingredients, peanut butter through ginger, in a blender or food processor. Blend until well mixed; set aside. In a skillet, heat a little oil until shimmering. Saute tofu until golden. Let it sit on each side before you flip in order to get the nicest color. When it’s all toasted, add a few tablespoons of sauce and edamame. Cook for a few more minutes until edamame are warmed through. Toss soba noodles with remaining sauce. 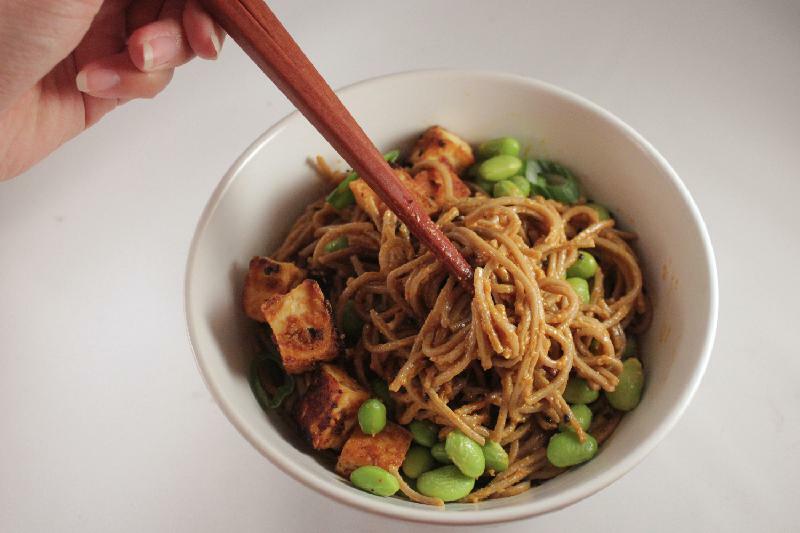 Served topped with tofu and edamame, green onions and sesame seeds. Enjoy!